i mentioned earlier that the countries of southeast asia were more different from china than i had expected. 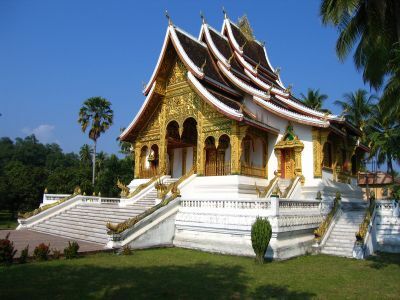 that includes the architecture; i thought i had seen it all while in china as far as buddhist temples go but i found those in laos quite different and more interesting...like this one in luang prabang. i ran into marie and camilla - two of the three norwegians that i traveled through china with - on the streets of luang prabang . they had just rented bikes so i got myself one and we rode through the countryside together. 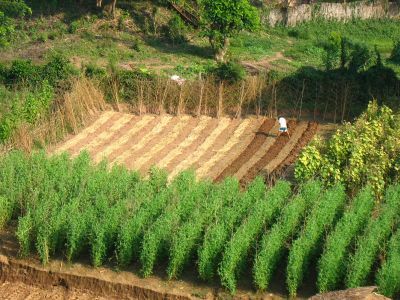 this farmer caught my eye. 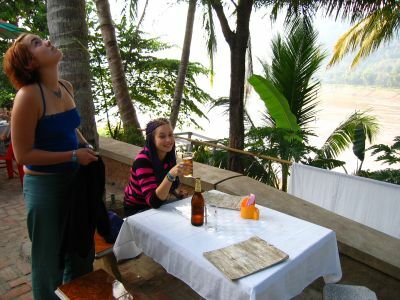 so after riding we went to a riverside restaurant for a few beerlaos. marie is toasting me as camilla makes sure she isn't sitting below a head-smashing coconut. 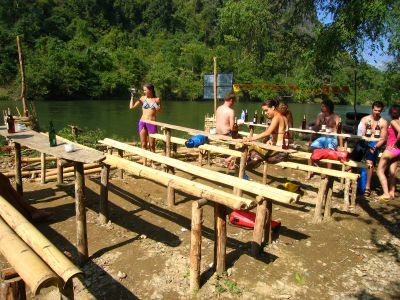 we took off after a few days to vang vieng, laos; paradise by the river. we had dinner at a bamboo hut where camilla and marie posed for this shot. the waiter takes our order. 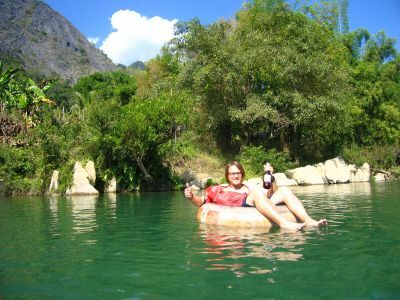 what you do in vang vieng is you go tubing, drink beerlao, explore riverside caves, and jump off trees or cliffs into the water. you rent a tube from these guys, then they load you and your tube up in the tuk-tuk and drive you to the starting line. you meet the people in your tuk-tuk and float down the river with them, furthering the cause of world peace. two swedes, two norwegians, two australians, and one american cameraman prepare to tube. floating down the river with a beer in my hand, surrounded by mountains, the sun shining on me, friends drifting next to me with no deadlines looming, no troubles on my mind, no worries at all. my lord, does it get better? need a fresh beer? no problem. the people who run these riverside bars will extend a long thin bamboo pole out to you and pull you in for a new cold one. you can get one to go or stop and meet some more people to tube with. is it hard to believe that i tubed the river again the next day?